A piece like the BR 03-92 Bi-Compass is rare in the watch world. It’s inspired by actual airplane compasses but stands out on its own as a piece to be worn with or without a pilot’s license. And I really like it. The piece is based on an in-cockpit compass and features a bold, well-lumed minutes hand and a huge hours hand on an inside disk. The entire thing is inside a massive PVD-coated case. B&R has also used the Isonorm font, the readable font used by airplane manufacturers for important readouts. It runs a BR-CAL.302 automatic mechanical movement. 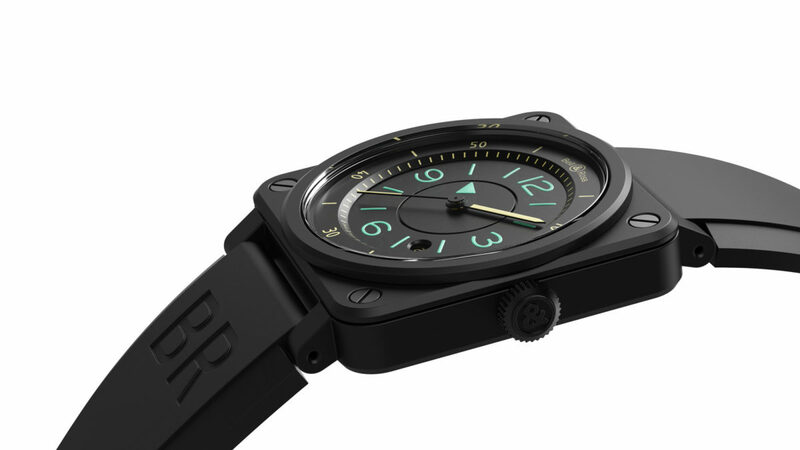 The simplicity of the BR03-92 BI-COMPASS’s design encases the complexity of its inner workings. Built on a two-tier basis, the dial divides its main center part with the outer part – where the minute track is featured – through a small “step” equipped with a minute-circle. To enhance legibility, the hour and minute graduations have been separated to promote the minutes on the main dial – as in original instruments – while the hours are displayed in the center. The hour reading is indicated by a green triangle marker which appears in the center through an independent concentric disc which is not graduated. An ultra-light disc needed to be created to ensure that the power reserve nor the accuracy of the watch was not reduced. Fur- thermore, the disc needs to be sufficiently resistant so as to not become deformed or risk any friction. This dual challenge has required the development of specific materials and new techniques. As it rotates, an adjustment to the nearest micron ensures that the disc is constantly parallel. The accuracy of the assembly requires all the know-how of master watchmakers. The 42mm watch is available for pre-order and will deliver in April 2019. You can pick it up for a surprisingly tame $3,900 online – just another clear benefit of the direct to consumer model B&R pioneered and a boon to airline pilots who may need to spend more on jet fuel this season.